You know how important it is to look after your health. It’s no different for your vehicle. 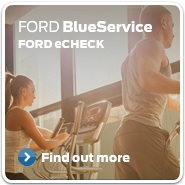 That’s why we offer a free 30 point FORD eCHECK with any service. It’s a bumper to bumper assessment, designed to give you a comprehensive picture of your vehicle’s health. That way, you can enjoy the reassurance that your vehicle’s in tip-top condition – and that there are no surprises around the corner.